Word processors have been around as long as computers had keyboards, but there’s still something new anyone can learn about Microsoft Word. The latest version has a slew of new features, but at least one of these five Microsoft Word tricks will be new to anyone you talk to – even that young intern who was using a computer before she could walk. Navigating keyboard shortcuts is essential to remaining productive since your typing speed slows down when you have to navigate a graphical menu. 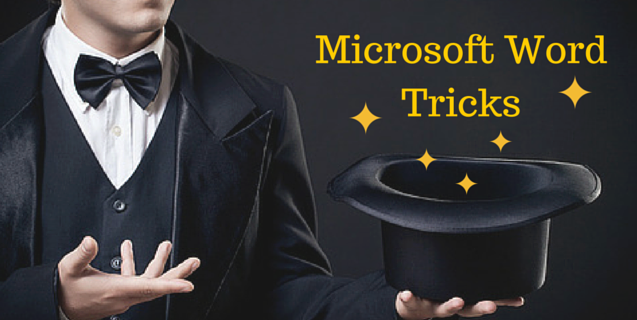 Speed and accuracy are the most important productivity measurements in MS Word, and Ctrl-F1 is a useful shortcut. When working in a table, list or even with paragraphs, use Alt + Shift + the up or down arrow keys to reorder the text. This keyboard shortcut can be much quicker than using a cut and paste technique. Each press of the arrow key will move the selected text up or down. This tip can be quite useful when reordering table rows. Online math courses are among the most difficult, mostly because you have to type out each individual step, and even College Algebra is tedious to type out step by step. Word includes an Equation Editor that can be easier to use than any TI graphing calculator. 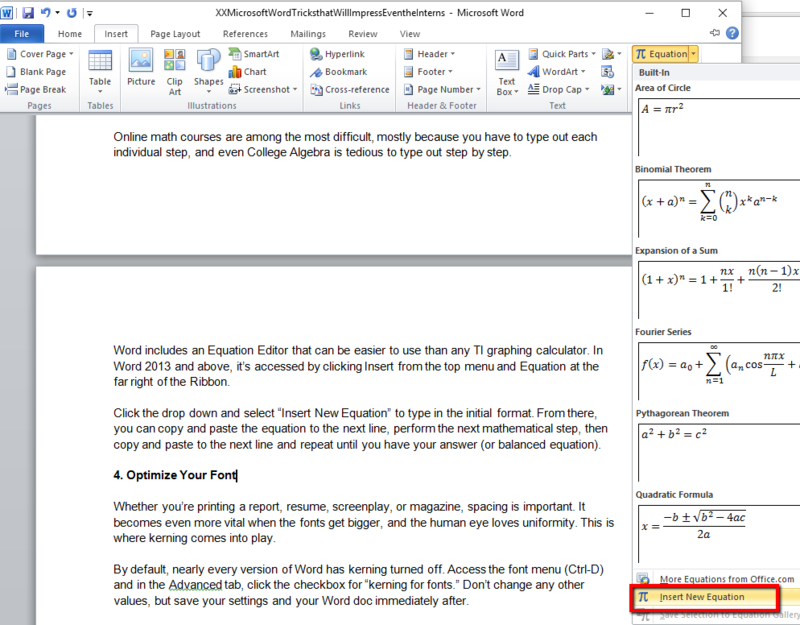 In Word 2013 and above, it’s accessed by clicking Insert from the top menu and Equation at the far right of the Ribbon. Click the drop down and select “Insert New Equation” to type in the initial format. From there, you can copy and paste the equation to the next line, perform the next mathematical step, then copy and paste to the next line and repeat until you have your answer (or balanced equation). Whether you’re printing a report, resume, screenplay, or magazine, visual appeal is important. As fonts get bigger, letter spacing becomes more apparent. This is where kerning comes into play. By default, nearly every version of Word has kerning turned off. 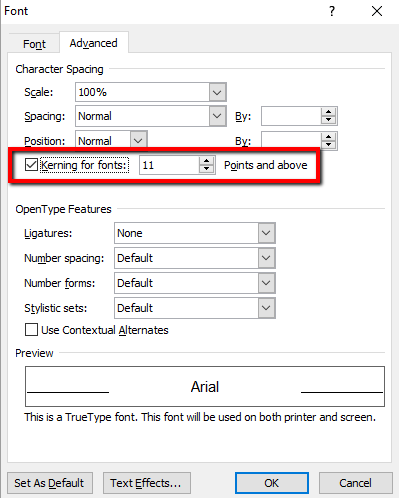 Access the font menu (Ctrl-D) and in the Advanced tab, click the checkbox for “kerning for fonts.” Don’t change any other values, but save your settings and your Word doc immediately after. Turning on kerning adjusts letter spacing by tightening spaces between letters when it would look better. If you prefer to have kerning turned on all the time, select that box when installing Word on a new device so you never have to think about it again. A very useful feature when dealing with pictures, graphs, and other visual objects in Word is to place a page break above and below the object. This ensures it’s printed on its own page without leaving you to worry about formatting the text around it. Click Insert and select Page Break, then insert the object, insert another page break, and move on. If these tips impress you, be sure to sign up for a MS Word certification course to refresh your skills and stay up to date on current Word tricks, tips, and features.